looking for a rebound against SMU. Thanks to a pair of third period goals by Dani Miller, the Lady Tommies pulled out a 4 to 2 victory over last place Saint Mary's this afternoon in Halifax. You have to give credit to the Huskies, as they stuck with the Tommies for most of the game. SMU opened up the scoring at 5:28 of the first period on a goal by Kaitlyn Abbass. STU responded late in the period on the powerplay when Courtney Fox (MacIsaac) potted her third of the season at 18:46. Shots were close at 14 to 12 for STU. The Tommies took the lead just over a minute into the second frame as Katie Brewster (McTaggart, MacIsaac) scored her 10th of the campaign. The Huskies evened things up with 4 seconds to go in the period, beating Julia Sharun with a powerplay marker of their own. With the score even heading into the final frame, STU had to come out gunning. Cue Dani Miller. In the third it was Miller time. 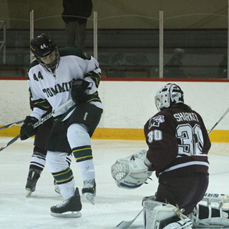 Dani scored early, 54 seconds into the period assisted by Captain Blackmore and again at 3:14 unassisted to give the Tommies the eventual 2 goal margin of victory. Final shots on goal were 36 to 29 for St. Thomas and Julia Sharun picked up her ninth win of the season. The victory moves STU two points up on Dalhousie for fifth and three back of UPEI for fourth with two games remaining. Next game for the Ladies will be their LBR swan song as they take on Moncton Friday night at 7 PM.